Our new line of Wireless sensors and interfaces utilize Bluetooth® Smart technology for much longer battery life before needing to be recharged. But when you do need to recharge a classroom set of AirLink interfaces, wireless sensors (such as Force Acceleration or Pressure) or Smart Carts this is an ideal and space saving solution. And of course it can also recharge your other classroom technology via USB connection. For example, up to 5 iPads may be charged at one time. Each USB works independently. 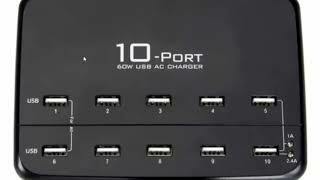 The Max power of this charger is 60W and max current up to 2.4A.